But for seniors, graduation is all about memorializing the past. 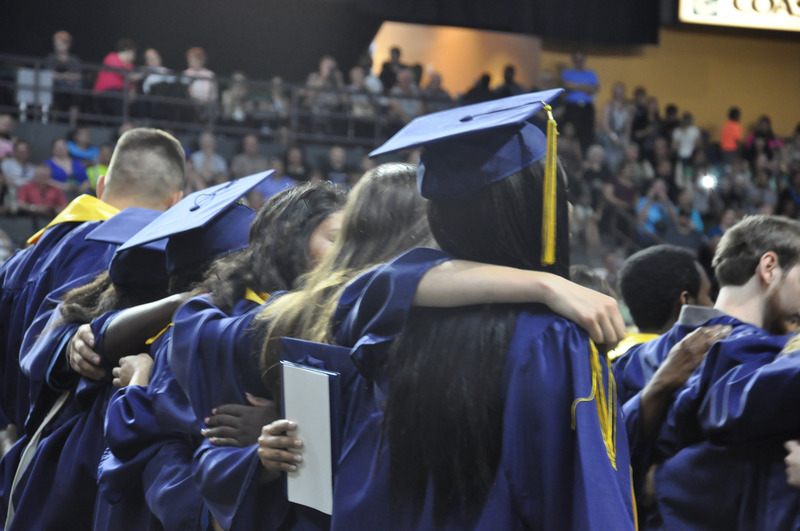 College and beyond is still a mystery, Student commencement addresses often give generic lip service to ‘the future’ before moving on to what students really wanted to talk about: the community of teachers, peers and friends they are leaving behind. Whether part of a huge graduating class at a traditional high school, a small private or an alternative school, students all brought the conversations back to their treasured school communities. One of five 2015 valedictorians at the private Catholic High School, Pangelinan was the only senior to love Blanchet so much that he was never tardy or absent for any class during his entire four years. Pangelinan looks forward to his academic career studying computer science at University of Washington but will miss days of running cross-country, participating in Knowledge Bowls and attending daily geometry parties in Mr. Freeman’s class after school. Emily Rich, Luis Estevez, and Elias Nelson were the chosen graduation speakers at SAS in Bothell, a small Northshore school which accepts students who want an alternative from larger schools in the area. For many students, high school is family. Estevez’s commencement speech was preceded by an introduction by Tony Olney, his social studies teacher. Olney called Estevez “the Godfather of SAS. He’s who people come to for advice and approval.” The Godfather’s speech recalled how his initial doubts and insecurities about school melted away as he became more and more determined to leave his mark at SAS and inspire others to do so. “No one from my family has graduated from high school,” Estevez said. “I wanted to change that. I wanted to do it for my younger siblings.” All Estevez’s family members — his immediate family, his extended family, and school family — whooped and cheered throughout his speech. Tiffany Hiliker graduated from Mariner High School in Everett with a similar story. She conquered her fear of public speaking by auditioning for the spot as commencement speaker for Mariner High School, and her speech exuded not fear but excitement. Other graduates kept the crowd laughing and smiling as they recounted two years of inside jokes, made fun their teacher’s basketball skills, and pledged to find success in the future by “wearing cool sunglasses and using charm.” The evening ended with promises to keep in touch and never forget the lessons learned and relationships built at the academy.